Throw a piece of swag at a marketing conference and you’ll (lightly) hit someone who can tell you about the importance of an email list. Despite new and flashy marketing channels constantly popping up, email remains one of the strongest for so many companies. According to eMarketer, 73% of in-house marketers worldwide said that email marketing provided a strong ROI in 2017, making it the most commonly reported answer in their survey. But most of the email marketing advice out there is focused on building your list. Collecting subscribers. Hoarding fans. They don’t explain how to actually turn those subscribers into leads and customers. Remember, building your list is only the first step in the email marketing process and converting your audience into customers. If you don’t use that list wisely and plan how to move subscribers to the next step, the rest of the buyer’s journey will never take place. But when used strategically, email marketing is one of the most all-encompassing marketing channels you can use. It doesn’t just build an audience or generate leads, it’s incredibly effective in every single stage of the sales funnel. From capturing visitors at the awareness stage to nurturing current customers and retaining them long-term, email reliably gets results. Does this make you want to shape up your strategy ASAP? Good. It’ll be worth it. Before you get to work, let’s break down what your email strategy should accomplish at every stage of the customer journey, and examples and ideas to get your brainstorming started. Building your list may not be the beginning and end of a strong email marketing strategy, as some marketers make it out to be, but it’s definitely the start of the process. Email opt-ins are one of the best ways to capture website and social media visitors at the top of the marketing funnel who aren’t yet ready to buy. When someone comes to your blog, for example, and enjoys the content and overall experience but isn’t ready to buy your product, subscribing to your email list is an alternative call-to-action that still brings them closer to becoming a customer. Someone handing you their email is essentially inviting you to market to them, as long as you provide value as well. Given how hard it can be to reach your audience on other platforms, say algorithm-determined news feeds, you want this direct relationship with as many people in your audience as possible. But they’re just as aware of how personal giving you their email address is, compared to something like following you on Instagram. Because of that, getting strangers to subscribe to your email list can be a challenge - especially if they’ve got hundreds of emails in their inbox already. The email newsletters we’re talking about aren’t just your PDF pamphlet or weekly sales promos some businesses will call a newsletter. No, we mean high-value content that inspires, nurtures, and converts. 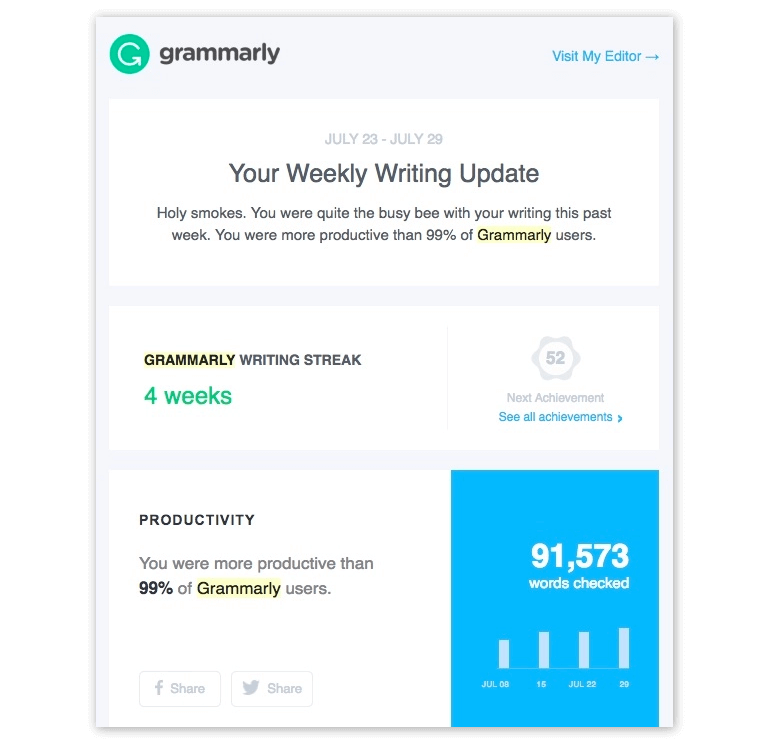 That’s what a good newsletter looks like, for example CoSchedule’s own weekly recap of new marketing advice, both from here on the blog and around the web. In an era where we’re obsessed with custom lead magnets and interactive webinars and newer, flashier content types, it takes great content to make one worth signing up for. 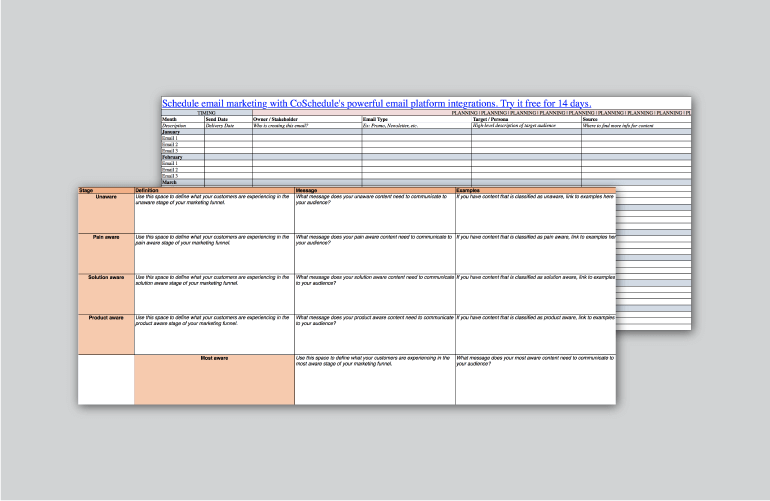 Determine a focused goal to base your newsletter strategy around, such as generating or nurturing qualified leads, driving customer renewals, etc. 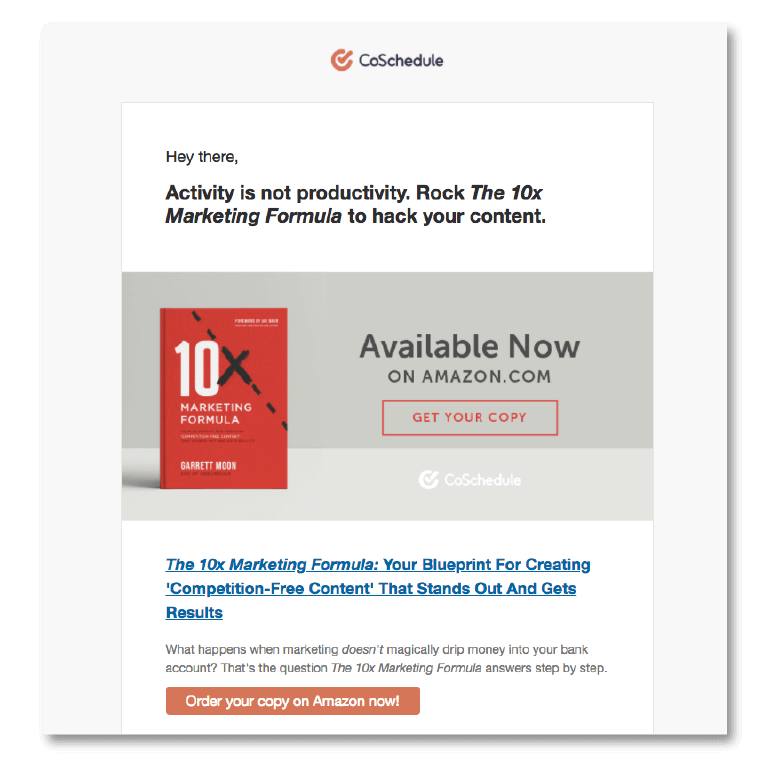 Create a theme and content strategy your newsletters can follow, like CoSchedule’s theme of the latest content to help marketers achieve their goals. Write newsletter copy that cultivates your brand. They may have an old reputation for being promotional and impersonal, some of the more popular modern newsletters, like TheSkimm and The Hustle, build such an engaged community by developing strong brand voices and personalities. Anyone can get started, no fancy technology needed. MailChimp is free to get started with and powers some of the most popular brands on the internet, so you can start simple with it and build your strategies out further as you scale. If sending a value-based newsletter every week for the foreseeable future, in addition to any more promotional emails, doesn’t fit into your content strategy, there are lots of other ways to attract new subscribers. 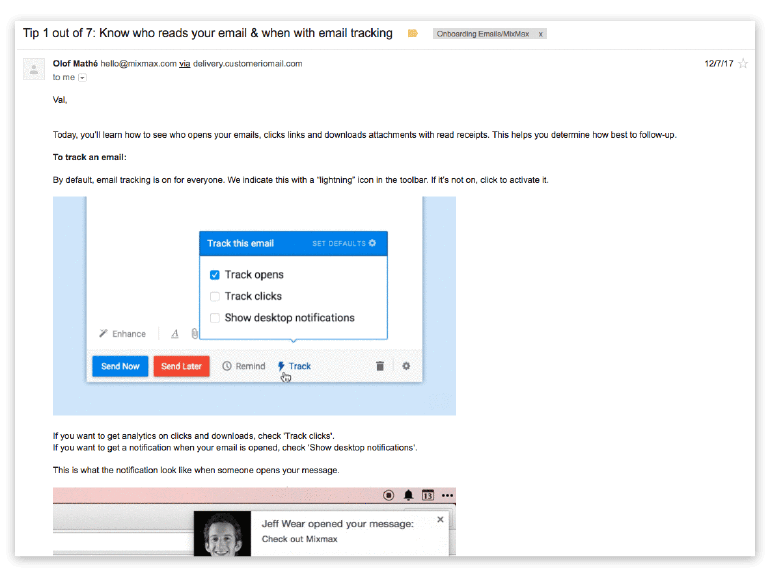 For example, trading a free asset in exchange for a reader’s email address is a great way to provide a ton of extra value without the ongoing content creation a newsletter can involve. 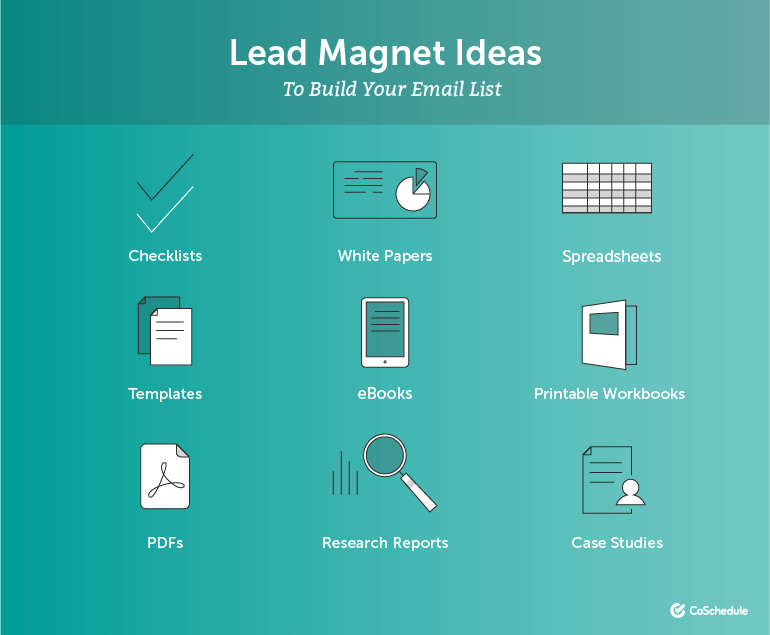 You can create and develop the lead magnet once and promote and mention it in blog posts and other content for months. You can also take free offers to the next level and instead of creating a PDF or downloadable asset, you can create an interactive tool subscribers can get get ongoing value from. Some great examples include CoSchedule’s Headline Analyzer, Mention’s Brand Grader, and Unbounce’s Landing Page Analyzer. To combine the educational value of content offers with the ongoing value of tools, something like an email course or challenge can give you the best of both options. They can involve a full series of emails, as opposed to a single downloadable asset. This can both help content feel more manageable to consumers, and help you build up a relationship with them over the course of a few days instead of a one-time transaction. You can choose to educate your new subscribers over the course of a few days, such a free 5-day email course, or focus on more action-oriented content with a challenge to achieve a certain result within the length of the offer. The final lead generation tool to mention today is live webinars. Live, video-based content is a powerful tool at every stage of the funnel, so it will be mentioned again, but one of the most valuable elements of webinars is how willing people are to hand over an email to attend them. That makes them gold for lead generation, especially when you really perfect it. Lead generation webinars can be done over and over on the same topic and taken on tour to new audiences, like a virtual public speaking circuit. This exact strategy was a major factor in growing ConvertKit from $98k to $625k in monthly recurring revenue. 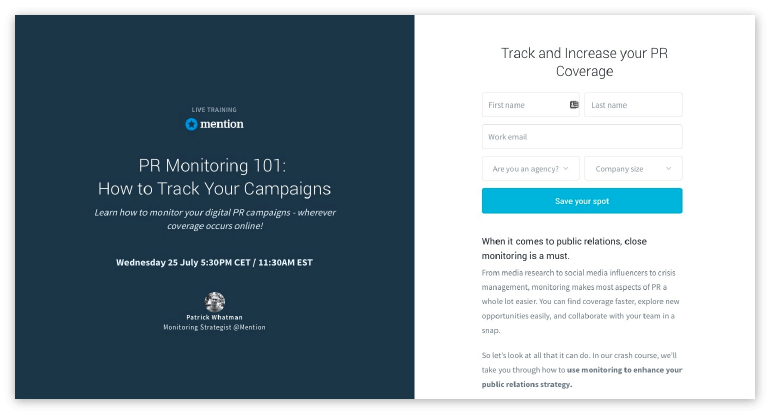 ConvertKit’s marketing team used collaborative webinars with affiliates to build an early audience and community around their product. They were able to perform the same webinar more than 150 times, each time to a new audience that converted incredibly well. Years later, it’s a tactic they continue today. With marketing-focused webinar tools that let you worry more about the content than technology, it’s become easy for businesses of any size to build full marketing campaigns around webinars. 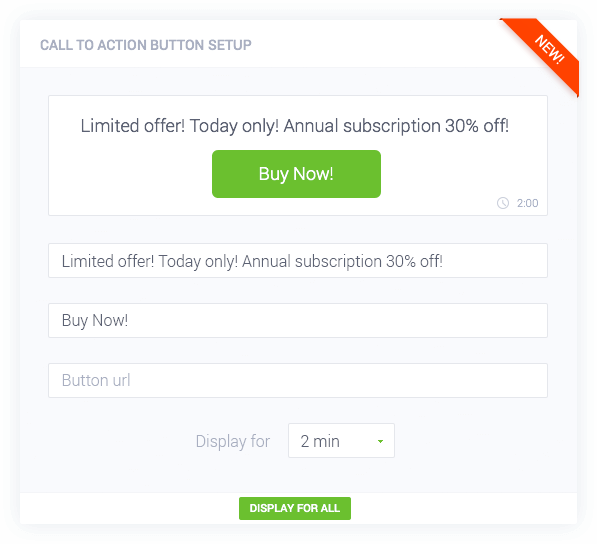 For example, ClickMeeting is one option that’s not just for running webinars, but converting from them with features like built-in call-to-action buttons. Once you’ve qualified someone and matched them to a buyer persona, you can match them to your most relevant product, service, value proposition, etc., and then plan emails that strategically guide them towards purchase. It sounds complicated, but with most email marketing and marketing automation software, it’s done easily and automatically. Lead scoring can be done the same way. And remember, drip sequences are your friend! By consistently emailing leads, you keep them engaged and have the opportunity to learn more about them through their opens, clicks, and replies. During nurturing, you want to continue providing value, building trust, and developing a relationship with your lead up until the final moment before they convert. Each email is a new opportunity to build more rapport with them as well as learn about their behavior and customize your marketing accordingly. You want to build up to the moment of conversion: where you’re talking to the right person with the right message and the right timing. How do you do that? Here are some of the types of emails that nurture leads and get them to the next stage of the sales funnel. 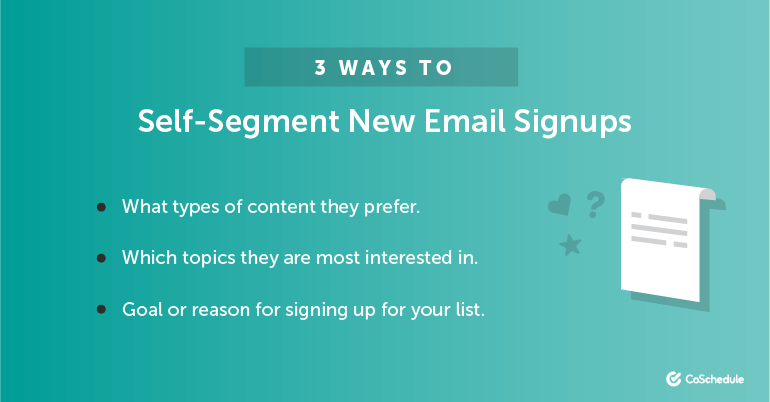 A self-segmentation email presents different options to your leads and lets them select which is most relevant. You can then move them into appropriate email segments based on which option or options they click. This works great as a welcome or confirmation email when someone first signs up, but you can ask someone to self-segment more than once and at any point in the buyer’s journey. Everyone appreciates the promise of more relevant and useful emails. Everyone appreciates the promise of more relevant and useful emails. Sending leads case studies, success stories, testimonials, and other social proof featuring customers similar to them will do that. Finally, continuing to offer free content that’s jammed with value will continue to make an impact throughout the funnel. As a lead moves through your nurturing content and you learn more about them, you can even get more relevant, personal, and valuable with that content. For example, by shifting the topics of your webinars from broader content to more solution-specific ideas, you can use them for nurturing as well as lead generation. Monitoring software Mention, for example, offers both topical webinars like those discussed above (like one they hosted with CoSchedule! ), as well as more product-focused webinars that are ridiculously helpful for those already interested in them. If you do provide multiple formats of nurturing content, like adding webinars to your email sequences, make sure you’re able to track results both per channel and for your whole funnel. 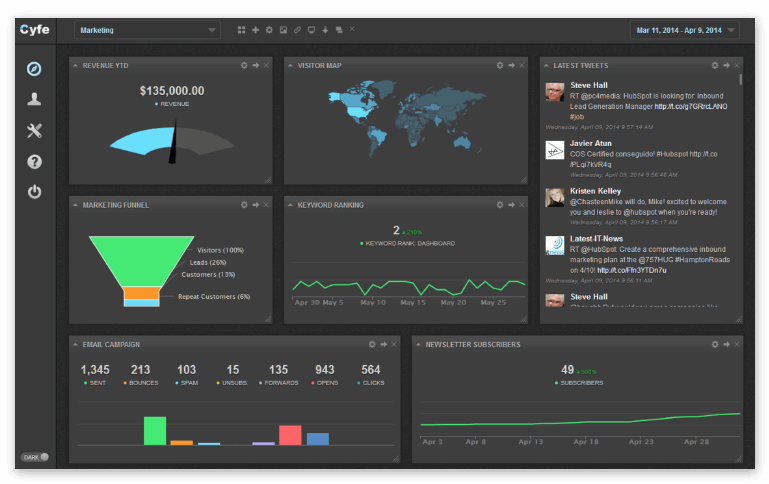 For example, marketing dashboards like Cyfe let you pull in information from multiple apps and tools to track all stages and locations of the funnel in one place. You would just add pre-built widgets for your tools like Google Analytics, InfusionSoft, and Unbounce at their proper places in your funnel map. Congrats! Your email lead gen and nurturing are fantastic and have primed leads perfectly. You’ve shown value, built a relationship, and fired off all the psychological triggers that have people ready to buy. This is obviously what you’ve been waiting for, the moment when your funnel (literally) pays off. With your email marketing funnel so carefully set up with the steps we’ve gone over, like using segmentation to provide super personalized value, you have a great chance of converting a new customer. And segmentation is about to come in handy yet again. In addition to using it to deliver more personalized nurturing campaigns, you can use it to offer your product or service in the most relevant way possible to each individual prospect. Between automated funnels and sequences and your seasonal/regular marketing calendar, you have lots of options for reaching your customers, all of which will be more successful the better the rest of your funnel is segmented. By combining segmentation with different conversion strategies like those listed below, you’re sure to be within reach once your customer has reached their moment of decision and purchase. Recommended Reading: How to Create a Marketing Strategy That Will Skyrocket Your Results By 9,360%"
Once again, at this point you’re searching for that perfect moment when your prospect is ready to buy. At this point, you’ve built up enough of a reputation with them that ads placed in front of them will convert well. You don’t need to stick to just email to reach them affordably - retargeting ads can be some of the most cost-effective kinds of paid marketing. For example, AppSumo was able to achieve a 224% ROI from a recent retargeting campaign. 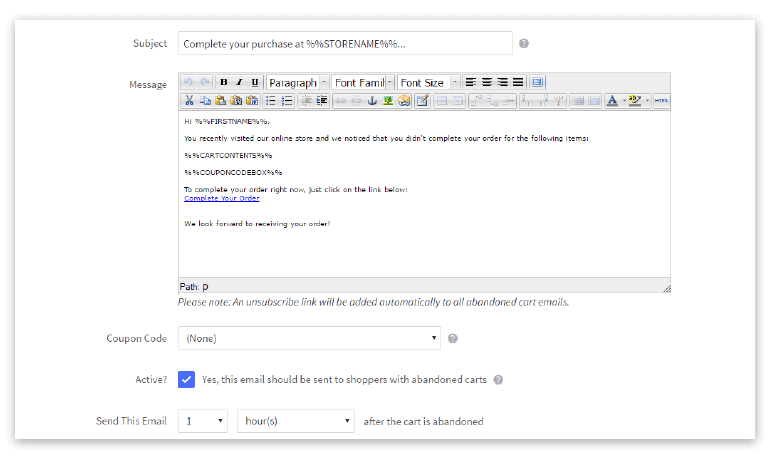 That said, email retargeting may be all you need, especially with your warmest leads, like e-commerce abandoned carts. Abandoned cart emails find people who’ve essentially already decided to buy your product, so offering it one more time is often an easy win. Another great way to convert well-nurtured prospects is through offers based on limited time and other urgency factors. By building authentic and ethical deadlines into your marketing, like expiring offers and discounts, into your funnel, you give warm prospects a reason to convert today versus next week. It’s a “get ‘em while they’re hot” approach that can lead to crazy high conversion rates when the situation is right. Finally, if you’re selling something with some kind of free trial like software, you can’t assume that they’re sold once they’ve signed up for a free trial. The true conversion - them becoming a paying customer - hasn’t happened yet. You still need to further engage and nurture them, and this is where it matter most. You can introduce tutorials, use cases, and more product-related content to get them to the final purchase point. For example, as noted in Val Geisler’s onboarding teardown, Mixmax sends their free users an introduction to the product in the form of an email course or educational sequence. Once someone becomes a customer and reaches the bottom of the sales funnel, you might think your job as a marketer is over. Sorry, but that’s not the case. Retaining customers and extending your relationship with them lets you optimize your lifetime customer value and increase your marketing ROI. So once someone becomes a customer, enjoy a very brief break, because soon it’s time to start working towards their next conversion. Email is one of the best ways to keep in touch with and nurture them here, too. You want to continually prove and increase value, let customers improve their experience, and make your product sticky in their lives, so they’ll renew, upsell, refill, or whatever you need them to do. It’s not too different from nurturing prospective customers, except that you can and should talk about your products and services more directly to keep customers engaged. And there are so many ways to do that. One important way to use email is to keep people needing what you offer. Whether it’s an app, physical product, or service, remind them and help them keep it in their lives. I love the way Grammarly does this. Since I use the free Chrome plugin running in the background, it’s not always at the forefront of my mind. But their weekly progress report emails giving me helpful stats and compliments (“You were quite the busy bee”), along with CTAs to use and upgrade my free account never let it fade to the background for long. In addition to keeping customers coming back, you also want to find opportunities to sell them bigger or related offers. The key to doing this without coming off as pushy, you’ll want to look for ways to recommend things in the context of the value you provide and your customer’s life. A great example of this is Care/Of vitamins. 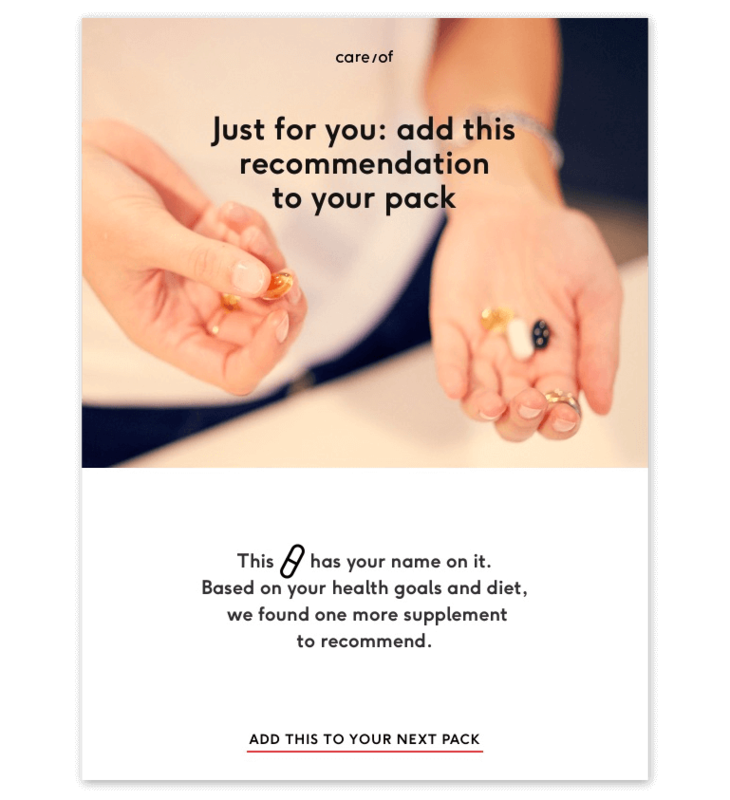 They send frequent product-based emails and newsletters that are super helpful and insightful, customized based on what products you buy from them. It allows customers to learn more about their health and products they’re already, and get even more free value. They win you over so well that the upsells and calls-to-action in the emails are completely natural and truly enticing. Finally, getting customers to buy again isn’t the only way to get more value and ROI from them. Customers have friends, colleagues, neighbors, and other people who might be your perfect customers. Advocacy marketing, referrals, and word-of-mouth let you use happy customers to find new ones just like them. While it takes a more mature product and funnel and should only be offered to satisfied and engaged customers, incentivizing already satisfied customers to share that satisfaction. Whatever is holding back your funnel from achieving your marketing goals, you can pinpoint what stage of the journey is the problem and create an email funnel strategy to solve it. Could something be holding back your email funnel from achieving your marketing goals? Brittany Berger is a content marketing strategist that helps B2B SaaS companies create unicorn content that's as optimized for personality as it is for conversion. She's also a sitcom connoisseur, one-person dance party expert, and has never met a fuzzy blanket she didn't fall in love with. Connect with her on Twitter at @thatbberg or subscribe to her YouTube channel for weekly content marketing tips.